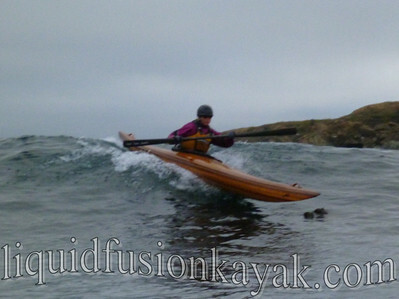 A couple of strip-built sea kayaks were dropped off for us to demo. "The Mattang" was designed to be a rugged, nimble surfing and rock gardening sea kayak. It was specifically built for the surf and rock gardens of the Mendocino Coast. 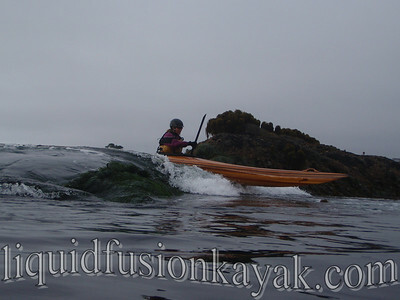 "The Sundance" was a gorgeous, 18.5' long, pointy sea kayak with Greenland and British design influences. We slipped out for an evening paddle. I paddled the elegant 18.5' Sundance and Jeff paddled the rugged Mattang. A couple of minutes after we launched from the beach, the bulkhead on my boat came loose and shifted forward of my feet, and the right thigh brace came unglued. I didn’t come unglued over these outfitting details (story of my life) and enjoyed the smooth, effortless feel of her gliding through the water. She was surprisingly nimble and turned well with a little edge. She was fast, sleek and efficient and very different from my 16 foot plastic Valley Avocet. It was a mellow evening, and we enjoyed a couple of rides on a rock garden feature called "The Toilet Bowl." We meandered over to Chicken Point which was breaking on some of the larger sets. I was content to sit on the edge of the break and admire and photograph Jeff and the Mattang in action. Jeff was tearing it up with her!!! He made that boat dance on the water. My friend Amy and her family were spectating from the bluffs. Of course they goaded me into catching a wave at Chicken Point. 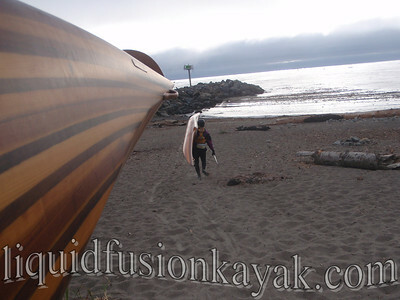 I thought, "Sure, great idea - surfing a rock-strewn break in an elegantly crafted 18.5’ wooden sea kayak with a hull design that had never been tested in the surf." I contemplated . . . worst case scenario . . . I would not be able to control the boat and end up broach surfed into the rocks . . . at least my friends would witness some spectacular carnage. As my friend Amy says, “I nutted-up” and got into position. The boat accelerated with ease onto the wave. As I dropped in, I felt totally in control. The bow and stern both rode high in the water allowing me to control the boat's direction. I edged her slightly and surfed her across the face of the wave. Huh? An 18.5 foot sea kayak that drops into a wave and edges and carves. The builder was ecstatic. He had no idea what she would do on a wave. Jeff and my friends were hooting and hollering . . . . I was grinning from ear to ear and paddling back for another wave. And caught another, and another, and another. On one wave, I actually dropped in and cut right toward the rocks and then cut back left. It was amazing and so much fun. So much for being crash test dummies . . . this time. Here's a video of our session using the rapid fire photos that Amy took from above on the bluffs. Ahhh - summer days manning Liquid Fusion Kayaking's headquarters on the Noyo River. In the summer, one of us is there daily taking reservations and renting kayaks. Lately, I have been manning the shop as Jeff has been out at sea. 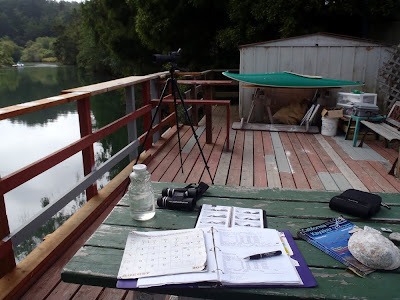 I have been a little behind on my blogging because we don't have internet at our shop on the Noyo River. Maybe some day, we will get our technology online or maybe not. If my office was a climate controlled cubical, I would probably go stir crazy without an online connection to the world (actually in a cubicle, I would go crazy with or with out internet). 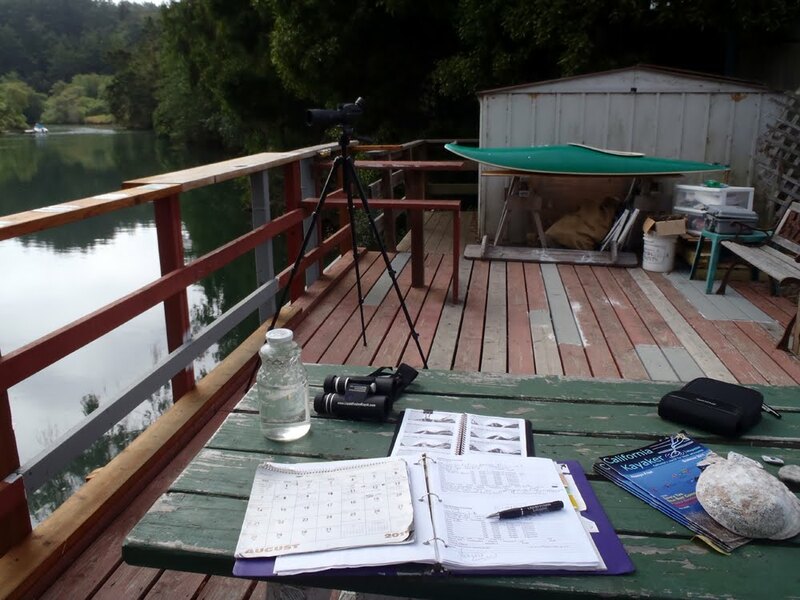 However, my office consists of a little gear shed and a picnic table on a deck over the Noyo River. Of course with a daily field trip via kayak onto the river . . . It seems to be a blessing not to be online when I am there as I get to be plugged into nature. I get to know what creatures are around and their daily habits. I know when the baby birds have left their nest and who is still under their parents' watchful care and who is being told to go away and find their own territory. 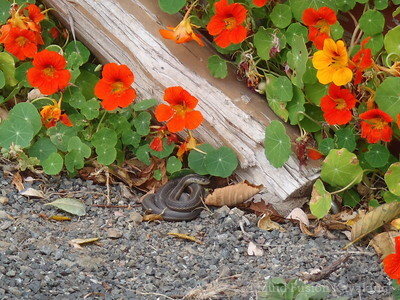 Hairy is a gartersnake that lives under a planter box on our deck. He has become one of the creatures that I monitor throughout the day. He monitors whats going on as well. 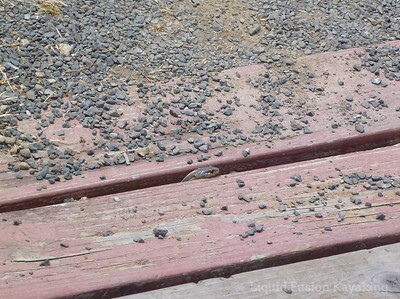 One of his favorite habits is to lie in a crack in our deck and peer about like a little periscope. He also likes to nestle in the nasturtium. His stripes are good camouflage, and I have to protect him from people stepping on him. 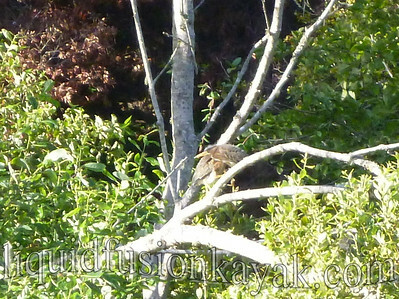 This week, I have been particularly enamored with 5 newly fledged green herons. They left the nest Tuesday afternoon, and I have been spying on them through my spotting scope. They still have downy feathers on their heads and are quite comical to watch as the climb and explore the alder trees above the Noyo River. Green herons are a special bird to me as they were "THE" bird that intrigued me to become interested in birds and birding. Well, time to get off line and back on the river. 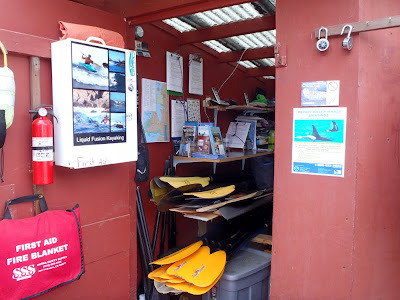 At the conclusion of our Eel River Paddle to the Sea Trip, we enjoyed burgers and beers at the Lost Coast Brewery in Eureka, CA and dreamed of our next adventure - the Lost Coast. Tentatively we have some dates set aside for us to paddle and explore during the fall of 2011. We are especially inspired to do this trip after reading Sean Morley's account of their recent trip. Check out their photos and story on the CCK blog. Our trip plans of course include kayaking and surfing but also some mountain biking, hiking, and exploring. This week, I begged a day off and got to explore a section of the Lost Coast by mountain bike with a group of the Mendocino Coast Cyclists. We rode the Paradise Royale Trail. 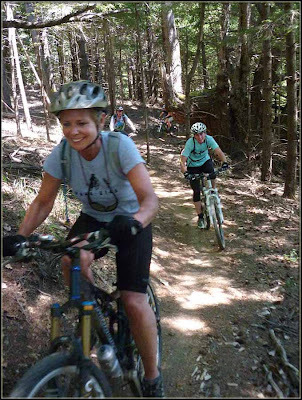 This is a sweet 14 mile bicycle trail designed for mountain bikes. It was SWEET!!! Can't wait to get back and ride it again and share it with Jeff - if I can get him off of the jumps and features of the terrain park. I am having camera issues again. Here's a photo that Roo took of Cindy and I climbing on the trail. 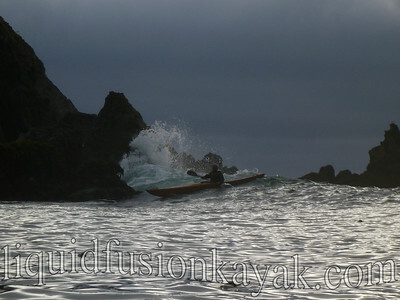 PS For those that want a guided sea kayak trip in the Lost Coast - Hawk Martin of Humboats is running one Labor Day weekend. Hawk has paddled and fished in that area extensively and does a great job of all the logistics of multi-day trips. We wish that we could go on his Labor Day Trip but have other adventures booked on the Mendocino Coast.